Given yesterday's shootdown of a NKR Defense Army Mil-24, the two presidents have that much more to discuss. Iran took Armenia's side at the outset of the Nagorno-Karabakh conflict, and as far i know, that political stance remain unchanged. Iran probably percieves Azerbaijan as a rival, despite having a majority shia population respectively. 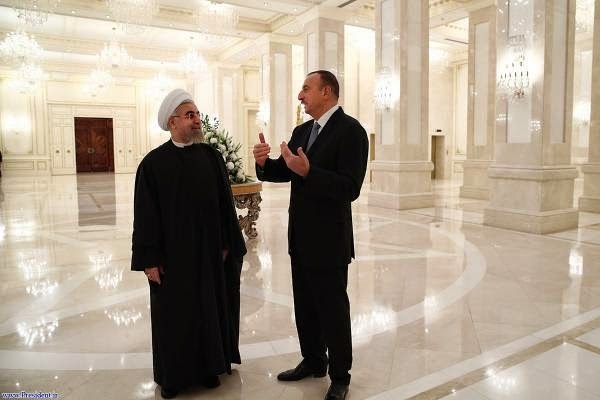 Iran's support for Armenia serves as a leverage to force Azerbaijan to grant Iran favourable deals in connection to the Caspian sea resources. This is untrue, Iran only began to support Armenia (by giving them electricity) only after Elchibey's bombastic rhetoric about "uniting" with Iranian Azerbaijan. This caught Iran's leaders by surprise as they expected Azerbaijan to naturally fall under its influence as they are Shia and a large minority of Iranians are Azeri, including the Supreme Leader Khamenei. Even so, Iran always sought to mediate a peace deal between Armenia and Azerbaijan and was close go doing so at one point, but successful Armenian advances put those talks to an end. Iran, Greece and Armenia signed a memorandum for 20 years ago for closer cooperation. At that time the new "Pan-Turkic" rhetoric was a threat to all three countries and as such it brought all three closer to each other. This cooperation is still alive if not emphasized due to dynamics since then such as Greece being part of EU and Iran being tagged as a rouge state. Akhoonds want influence over Azerbaijan ... if that's not Pan-Iranism then what would you call it ? keep in mind and don't deny that this pice of land was part of our homland Iran which was occupied and annexed by russians. These people are the most closely related to our people and to say the least have the same blood, culture, customs, traditions, religon and thoughts. But what is happening today is that this small country is controlled by someone who only think and do certain things that are in direct conflict with the Iranian interest. Having said that, it is really stupid to have a brother with strange behaviors as this president does. Close relationship with Israel which is Iran's number one nemesis or constantly continue with provocations. Just tell me, from which country flag Israel's unmanned aircraft over Iran few months ago? Was it from Azarbaijan or Armenia? If Iran was any other country it was definitly demolishing Azarbaijan, but they didn't. Armenia can also have close relation with Israel and benefit from that but they are not such a stupid nabour as Azarbaijan. They know that they can not have good relation with the biggest country in the region.